Alford Image Library - School Choir Competing in a Competition? School Choir Competing in a Competition? Is the year correct? What were these children doing? Is it Aberdeen? This picture was taken in Golden Square in Aberdeen. The children in the picuture would have been singing at the Music Festival. My Mum, Mrs. Isabella Cowe, was the Music Teacher at Alford and had great success with her Choirs. I left Alford School in 1958 to go to Inverurie. The children in the picture ie Jean Comfort (3rd row from the front)Joan Stewart and Jeanette Gillies (front row)Glynis Barron (3rd row from the back)Aldon Baxter (back row) were younger than me so I guess the picture could have been taken from 1959 onwards. The others I recognise in this picture are back row left to right. Bergen Barron, Anne Reid, Aldon Baxter, Bruce Riach. Others who I recognise who were in the same year at school are Mary Paterson, Jean Bremner, Jean Lingard, Eleanor Henderson and Anne Grant. We all left Alford School in 1959 so the picture could not have been taken after that. 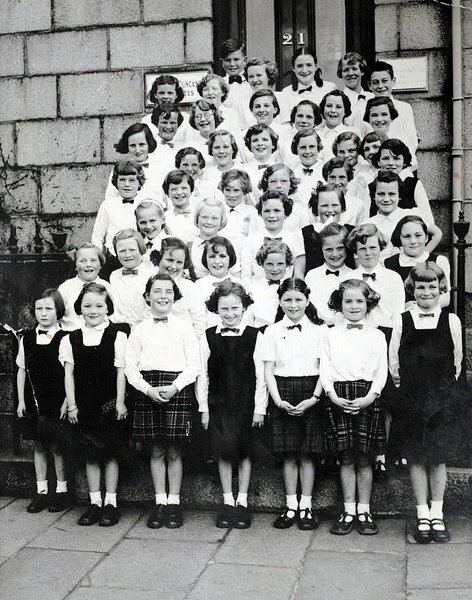 Others I recognise are Irene Murray extreme right second back row and Doreen Simpson extreme right front row. Eleanor Mitchell is also present in this photograph.